The Multi-Year module allows you to model changes that can occur over the lifetime of a project. 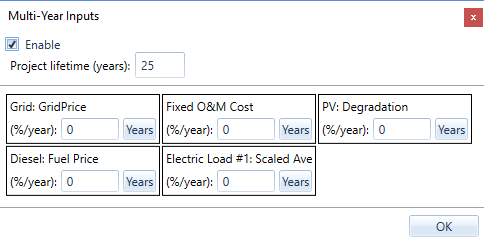 PV degradation, grid price escalation, load growth, and fuel price escalation are a few of the model parameters you can include in a HOMER model with the Multi-Year module. To access the Multi-Year module, click Multi-Year under the Project tab at the top of the page. The Multi-Year Inputs allow you to specify degradation or growth in terms of a percentage each year. You can also enter a year-by-year series of multipliers to match a forecast that isn't simply a percentage per year. The Multi-Year module adds several features to HOMER's results. You can look at each year of the project life in the Simulation Results. 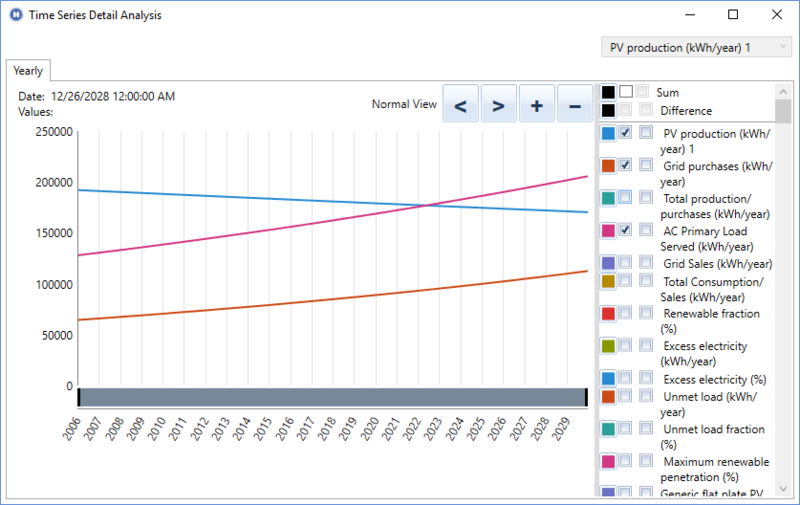 The Multi-Year module also adds the Multi-Year plot, which allows you to plot any result quantity over the life of the project. Using the Multi-Year module with the Advanced Storage module unlocks the full potential of both of these features. The Advanced Storage module includes the ability to model battery-performance degradation over the battery lifetime. This aspect of the Advanced Storage module is only available if you have the Multi-Year module.